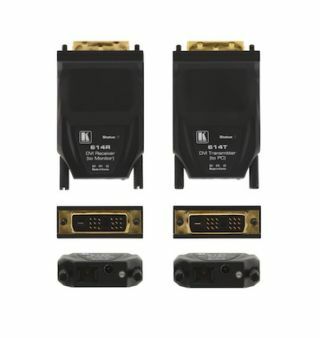 The What: Kramer Electronics has introduced the 614T/R detachable fiber optical transmitter and receiver set for sending and receiving single link DVI signals with resolutions of up to 1920x1200 at 60Hz, over one multimode fiber optic cable with SC connectors. Kramer has also introduced the 616T/R detachable fiber optic transmitter and receiver set for sending and receiving dual link DVI signals with resolutions of up to WQXGA (2560x1600 @60Hz) or WQUXGA (3840x2400 @33Hz vertical refresh rate) over duplex multimode fiber optic cable with two LC connectors. The What Else: Both pairs of transmitters and receivers operate up to a range of 1,640 ft. (500m) and feature EDID capture on the transmitter side that copies and stores the EDID from a display device to ensure a proper image on the display device employed. Both models are HDTV compatible and both models fully support the DVI 1.0 specification. The 614T/R operate together at a maximum data rate of 6.75Gbps (2.25Gbps per graphic channel) and support resolutions of up to WUXGA, including 2K and 1080p resolutions (XGA is not supported) utilizing one SC multimode fiber optic cable connector (Kramer C-SC/SC/OM series). The 616T/R operate together at a maximum data rate of 13.5Gbps (2.25Gbps per graphic channel times two channels each) and support HDTV resolutions of 480p, 720p, 1080p and VESA computer graphics resolutions from VGA to WQUXGA @33Hz (XGA is not supported), utilizing duplex multimode fiber optic cable with two LC connectors (Kramer C-2LC/2LC series). One More Thing: Both models come with external 5V DC power adapters (supporting auto-power switching function in the transmitters) and are housed in Kramer’s rugged, compact Nano TOOLs sized enclosures. Both models are also certified to FCC and CE standards for EMI/RFI emission, and both provide data security since they have negligible RFI/EMI emissions and prevent loss of video quality due to their lack of copper conductors.